IDRA President Dr. María "Cuca" Robledo Montecel salutes San Antonio Mayor Julián Castro, for his "smart city" initiatives and investments in creating a college-going culture, citywide. As a dynamic, growing city, strengthened by the diversity of its community, San Antonio is in an ideal position to expand pathways to higher education for all students and serve as a national model in these efforts. And it is a focus that is urgently-needed at this time. Mayor Castro’s Café College initiative, a one-stop gathering place for youth and families to prepare for higher education, was spotlighted in a recent Summit and Town Hall Meeting convened in San Antonio by the White House Office of Public Engagement and the White House Initiative on Educational Excellence for Hispanics. The Mayor's top priority--investing in education and the bright future of young people in the city--was at the forefront of his State of the City address last Friday. During the Summit, Dr. Robledo Montecel was asked by Univision's Teresa Rodriguez to discuss the role that families can play in advocating for their children. Following an interview with Mrs. Herminia Saldivar about key information parents need to prepare their children for college, the discussion (about five minutes into this clip) "Los padres deben ayudar a sus hijos a terminar sus estudios," was aired in the segement “Estudios Superiores a tu Alcance” (Postsecondary Studies Within Reach) on March 24, 2012, as part of Univision’s “Es el Momento” (The Moment is Now) education campaign. This one-hour education special highlighted the difficulties Hispanic Americans face at closing the higher education gap and identified resources available for students to complete graduate studies while controlling costs. IDRA is working to expand higher education access and completion through multiple strategies: strengthening preK-12 education; fostering partnerships among school, family, business, youth and community leaders to expand equity, college access and success; and providing key materials and data to support this work. Share this edition of IDRA E-News on Facebook or Twitter. IDRA’s bilingual (English/Spanish) OurSchool Portal provides key data on school inputs and outcomes for all districts and high school campuses in San Antonio, and across Texas. With a recent grant from TG Public Benefit Grant Program, IDRA is enhancing the portal to include additional data on college readiness, college sending, and developmental course-taking and to provide training for school-community-family partners on using the portal to strengthen student success. Visit IDRA's OurSchool Portal (English). OurSchool Portal (Spanish) (Portal registration is free). IDRA’s bilingual (English/Spanish) Achieve College ~ ¡Hacia Adelante! ~ A Guide for College Access promotes a collaborative approach to goal-setting and decision-making among student, family and school. It includes four steps: getting ready in high school, making a good choice of a college, applying early to several colleges, and planning to get financial help. 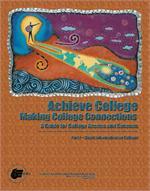 Includes a resource CD with a workbook for planning for college and checklists for ninth, 10th, 11th and 12th grades.